I’m always happy to start reading a new Banks novel (though not his scifi-books), I have bought a few second hand fairly cheap. 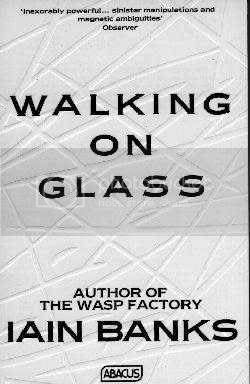 Walking on glass was my ‘nice weather book’. I’m afraid this might have been my mistake. I only read it when it was nice and warm, lying in the grass. That is not very often in this country, hence sometimes I went for weeks without continuing to read it. The story is about three different characters. Graham, Steven and Quiss are the protagonists of this book. On the backside it says their separate courses are set for collision. It might have been so, but I’m afraid I must have missed it then. Graham’s story is a good one, Steven’s story the most interesting, Quiss’ story gives me the impression that Banks has mixed his scifi and his fiction for this one book. One chapter at the time, which does inevitably mean that just when you got into a story, you have to wait for two chapters before you can continue. Again, it is probably my fault for not reading this book fast enough, but I just didn’t get it. I’m rating Banks high enough to throw in a lot of deeper meaning, plenty of symbolism, but it must have gone past me. The man who wrote so many great books, has disappointed me this time. I’m not bothered, there is a couple of other books waiting for me on my shelves. I’m sure they will be his usual standard.